Do they wobble to and fro? Sorry, that song is going to be stuck in your head for the rest of the day! On to more serious business. Every dog is unique. Not one is like another. So, their grooming will be unique as well. 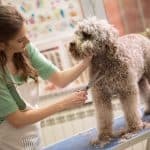 Depending on what breed of dog you have, there are usually specific ways to groom them to keep them happy, you happy, and your dog looking top notch. You would think that there would be no grooming involved here, but you would be wrong. Hairless dogs like a day at the spa, too! Well, maybe they don’t like it but they definitely need some grooming just like any other dog. 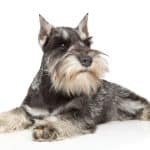 While having a hairless dog is considerably easier grooming than a long-haired dog, you certainly need to make sure you pay attention to them. The trick is to make sure their skin looks healthy. It’s all about keeping them clean and moisturized. Bathing a hairless dog is pretty low key and won’t take up too much time. Bathe them often enough to keep their skin clean but not constantly or their skin will dry out. Using a soft sponge is really helpful to remove debris gently. Follow up with some moisturizer and never forget the sunscreen! Now, if you have a double coat dog, you know we are talking about a whole lot of hair. In fact, the first dog that comes to mind here is Lassie. So, obviously, they need an extraordinary amount of grooming to keep them looking well fluffed and immaculate. The best way to keep double coat dogs grooming under control is to brush them and brush them often. Removing loose hair and debris is key to avoiding matting and tangles. Another point to consider is that they do have a double coat. Having a double coat means they have a more coarse outer coat and then a softer undercoat. Making sure you are grooming both coats is really important. If you neglect their undercoat you are going to end up with lots of matting and a mess on your hands. Make sure to use a slick or pin brush and a wide tooth comb to get through all of the hair. If your double coated dog is an outside dog, take particular care in checking them for twigs and leaves while brushing. These small pieces might not seem like a big deal upon first look, but they can get really entwined in your dog’s hair and you may end up having to cut them out. That will not make you or Lassie happy. Wirehaired dogs are great for a lot of reasons. A lot of times people buy them because of their reduced shedding. You may think with this style of hair that you wouldn’t need to do much for grooming, but there is always some type of grooming to be done! You still need to brush your wirehaired friend. Starting with a slick brush is a good idea to gently detangle that curly cue hair. The hair can get kinked and almost tied together if you go too long between brushing. Try and brush them a couple times per week with a slick brush for starters. Then you are going to want to use a stripping comb to get down to those tiny little hairs. 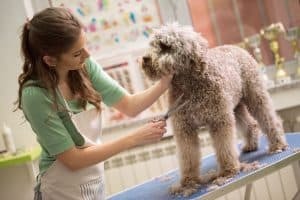 After you have given your wire guy some well-needed brushing, a gentle bath with a nice dog shampoo will remove any dirt and debris you may have stirred up. 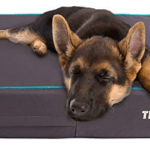 Now you will have a happy and healthy coat for your dog to go on enjoying. You would think the single coat dog would be really easy peasy to take care of since they don’t have that fluffy undercoat. I would argue they are more challenging to groom than the double coat dog, though. They usually have long hair and are prone to it breaking off or getting matted really easily. Brush your single coat dog and often. That is so important to avoid matting. You definitely want to make sure to wet them down either with spraying water on them or a conditioner prior to brushing. Otherwise, you are going to get breakage as we mentioned before. As long as you brush these types of dogs often, you will maintain their silky and beautiful coats. They can prance about your house with confidence with their stylish mane. Short hair dogs still need a good brushing now and then! 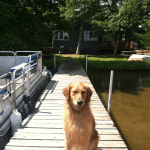 They may be really easy to groom because their coats are short and relatively mat-free. I’ll give you that, but if you neglect their grooming you are going to run into some issues. Using a slick brush is the best way to brush these types of dogs. That way you are getting all the loose hair and debris out of the way. Keeping them clean with baths doesn’t hurt either! Although, be careful for over bathing because it can dry out their skin. This category of hair has to be one of the most complex to groom. There’s the detangling, the brushing, the bathing, the brushing, the blow drying, and the brushing. Did I mention the brushing? Here’s the deal, you knew what you were getting into with a long haired dog! You knew there would be lots of grooming right? Let’s walk through the basics. First, start off by detangling your dog’s hair with a dog detangling solution. I would highly recommend using your hands first THEN a brush so you don’t hurt your dog or break their hair. Next up, you are going to want to do a nice thorough brushing going in the direction the hair hangs on your dog. Once you are satisfied that there aren’t any mats or tangles left, you will want to bathe your dog. Finally, you are going to comb through your dog’s hair and blow dry. You may even want to throw in another round of brushing after this depending on how great your blow drying job turned out. Whew! What a process. Oh, Do Your Ears Hang Low? No matter what kind of dog you have, there are guidelines to follow to keep them looking so fresh and clean. Nobody likes the looks of a mangy dog. 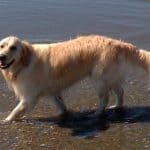 Even our golden retriever’s hair can get out of hand at times but if you implement weekly grooming in your routine, you can keep them healthy and happy. Let those beautiful furry pets walk proudly down the street!